Just a quick note here. I had the good luck of hearing historian Joanna Bourke on BBC Radio 4 program Start the Week yesterday morning who was on the show debating the topic of her latest publication titled, The Story of Pain: From Prayer to Painkillers. The book focuses on trying to understand and contextualise the feeling of bodily and physical pain from the 18th century AD to the modern period. Bourke, who is a Professor of History at Birkbeck, University of London, presents a holistic history of understanding pain in which the topic is approached from numerous angles, including not just the medical but also the cultural, religious and political. The book also deals with the personal experience of pain and the nature of suffering, both in the individual sense and within wider society from the family out. It certainly looks like an interesting and enlightening read. Having read a few reviews of the book itself, and of having heard Bourke herself discuss the differences in understanding the many types of pain, it reminded of sociologists Ann Oakley’s 2007 book Fracture , of which I discussed a little here. Although Oakley’s book is a much more personal and reflective study with its focus on the modern health perspective, Bourke (2014) also discusses the role and changes that medicine has gone through in the past and present approaches and treatments when considering illnesses and patients themselves. Of particular interest on the radio show this morning was Bourke’s assertion that different cultures experience pain in a myriad of ways. This, of course, made me think of how bioarchaeologists approach the archaeological record and how we try to understand palaeopathology in relation to the individual osteobiographic context, within the population and society that the person lived in, together the original context of the landscape environment of the archaeology site (read more about osteobiographical examples here). Bioarchaeology is, as a field, a burgeoning area of archaeological research, one that ably and actively straddles the humanities and science divide with ease. Bioarchaeologists often complement their normal macro and micro assessment of the skeletal remains with the regular use of the latest scientific techniques and refinements, including but not limited to stable isotopic and ancient DNA analysis, to help understand the processes, implications and contexts of a pathology within a population. This often includes trying to contextualise and understand traumatic or congenital pathologies that can be present in the skeletal remains of humans (White & Folkens 2005). It must be remembered of course that only a small fraction of diseases known ever affect or actively present on bone itself (Waldron 2009). Pain though is rarely considered when describing a pathology that is present on an archaeological bone. This is partly due to the nature of the limitations of archaeology, but also partly due to the existing bioarchaeological literature. Care to not exceed the evidence must take precedence, otherwise bioarchaeologists risk inflating the boundaries between the known and the unknown. Pain itself is a uniquely personal feeling and it can be a difficult feeling to describe. It can also be paradoxical as to know pain is to be reminded that you are alive, but to know that pain means it is also a warning that life is threatened. As a purely personal perspective I have recently found out something rather interesting about my own skeletal biology. As readers of this blog may be aware that I have McCune-Albright Syndrome (MAS) and, as a part of this, polyostotic fibrous dysplasia. MAS is, as far as it is currently possible to tell, a fairly rare bone disease that can lead to fractures and bowing of the bones (more information here and also Dumetriscu & Collins 2008) amongst other things. Having broken a good number of the long bones of my body, I am now acutely aware of what a fracture feels like. Recently however, and completely unbeknownst to myself beforehand, I learnt that I have been fracturing my ribs for a number of years, as both x-rays and a CT scan showed a fair amount of bone re-modelling and faint healed fracture lines on a number of ribs. Partly it was because the fractures themselves weren’t that painful (I am well aware that rib fractures are usually pretty painful). In fact I have been aware for years that I occasionally pull the superficial or intercostal rib muscles on either side periodically, and that this had always led to a good few days of unease if I slept on the affected side, coughed or laughed too hard. I had put this down to using the wheelchair more over an extended period of time starting from my mid adolescence, following on from several major surgeries on the femora. I reasoned that due to repetitive nature of the motion of wheeling in a manual wheelchair the muscles were bound to get sore and fatigued at some points. A copy of the posterior to anterior x-ray of my own chest. 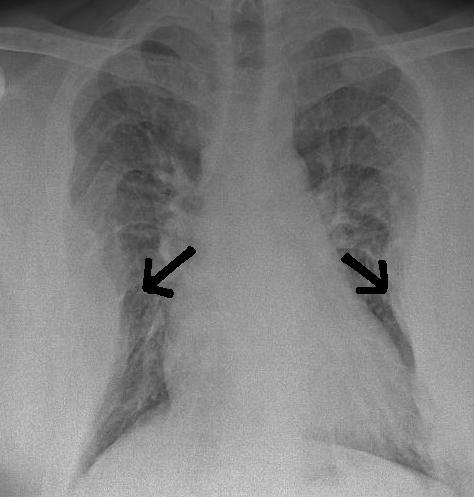 Although the healed rib bruises and fractures cannot clearly be seen on it, the constriction of the chest wall is highlighted (black arrows). This can have an effect on the air intake of the lung capacity. Generally fractured ribs are left to heal naturally unless there has been puncturing of internal organs by the ribs themselves, in which cases surgery is needed. (Read more here). I was well aware that the ribs are one of the more common areas of the body to be affected by MAS, along with the femora and cranial bones, yet I paid little attention to what I thought was a pulled muscle (Dumetriscu & Collins 2008, Waldron 2009). I could still move relatively fine afterwards, and it certainly wasn’t that painful. So, as you can imagine, I was somewhat surprised to hear that I had at least four previous rib fractures that had healed, which were clearly evident on the X-rays and the scans taken of my chest as I saw. I should state though that it is likely to have been a mix of micro, hairline and full fractures on pathologically diseased bone, and not traumatically induced fractures which, I hear, can be extremely painful. As such, and having heard Bourke talk about how individuals cope with pain, it should be taken into account by bioarchaeologists that skeletal pathology probably elicited different responses dependent on the social and cultural context of the individual. This is of course important when considering the impact of a pathology present on the bones. This, necessarily, becomes more problematic as we reach further into history and prehistory, where the lack of contextual and written evidence can be missing or non-existent. However, as archaeologist and bioarchaeologists, we must also continually ask questions regardless and especially when skeletal material has already been analysed. New techniques, theories or methodologies are only useful once they have been applied to the existing archaeological record and are repeatedly tested against what we think we know. Alongside Bourke on the Radio 4 show was the current director of the Wellcome Trust, Jeremy Farrar, who discussed his experiences as a medical doctor and the possible implications of the overuse antibiotics, and Norman Fowler, a conservative MP who oversaw the public health campaign against the spread and threat of HIV/AIDS in the 1980’s in Britain. Each guest on the program was well worth a listen. It is safe to say that Bourke’s work is another book that I shall be adding to my ever increasing pile. Listen to the Start the Week program, on which Professor Bourke appeared, on BBC Radio 4 here. A review by The Guardian of the History of Pain: From Prayers to Painkillers book be found here. Bourke, J. 2014. The History of Pain: From Prayer to Painkillers. Oxford: Oxford University Press. Dumitrescu, C. E. & Collins, M. T. 2008. Overview: McCune-Albright Syndrome. Orphanet Journal of Rare Disease. 3 (12): 1-12. (Open Access). Waldron, T. 2009. Palaeopathology (Cambridge Manuals in Archaeology). Cambridge: Cambridge University Press.